Putting a jigsaw puzzle together can be a fun pastime. Half of our family really enjoys it. The other half gets annoyed about the pieces being scattered around our table until the project is complete. Each piece of a jigsaw puzzle is designed to interlock with other pieces. When done properly, the pieces fit together creating a beautiful picture and a sweet sense of satisfaction. God, like a Master Jigsaw Puzzle Designer, created each of us with strengths and deficits that beg to be connected to others. We are not designed to fly solo. As your school year is taking off, you have done much planning for the successful education of your teens, but have you allowed time for the connections needed to keep yourself healthy and refreshed as their teacher? Your teen’s education is a commendable priority. It is beneficial. It is demanding. 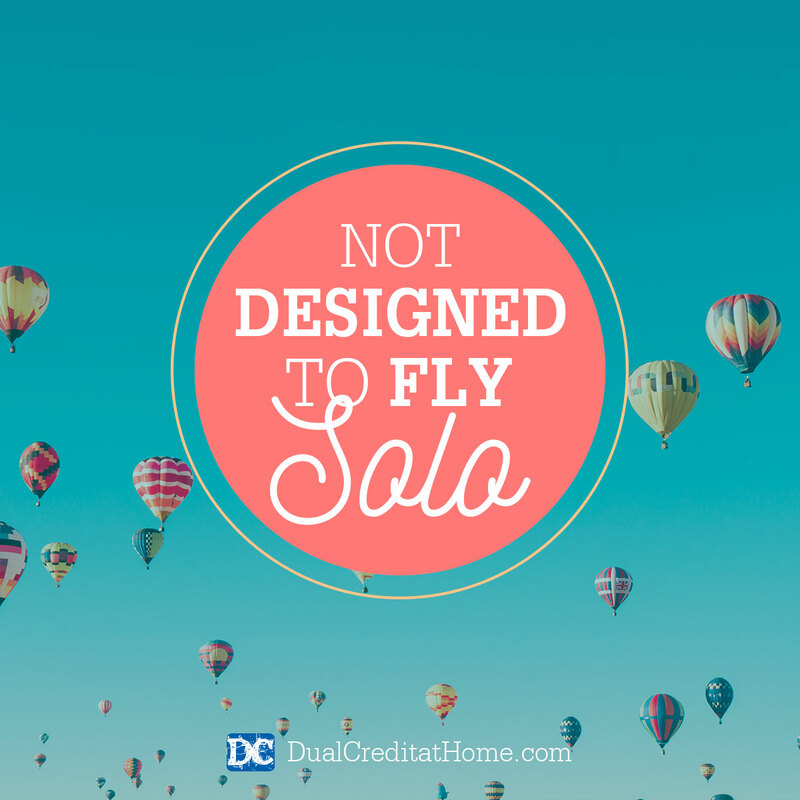 However, remember you are not designed to fly solo! Consider the scene at creation. God created light and darkness; atmosphere and oceans; dry land and vegetation; sun, moon and stars; birds and fish; and finally man. God looked at creation. He saw man. He concluded that it was not good for him to be alone. (Genesis 2:18) From the very beginning God’s design shows us we are not created to “go it alone.” It is obvious that God designed them to do life together. Looking further down the road, we see that God chose a nation, a group of people to call His own. God gave skills to workers to design the furniture for worship; He called and equipped some to be priests. (Exodus 33). He gave some the gift of leadership. Later in the New Testament we see His design for the church. As believers, He gives us each gifts. Every believer has a gift that jettisons out to fill a hole in others’ lives. God shaped each one of us with strengths and weaknesses. When fitted together all these pieces display a beautiful picture reflecting our Heavenly Father. You are designed to be connected with others. Any time God has a plan, it seems that Satan develops a counter plan. In this case, he loves to move us toward isolation. He lures us into perpetual activity. Don’t let him win! It may require creativity, effort, and plans, but if God designed us to be connected to others it would be senseless to fly solo. – Stay involved at Church. – Utilize a local homeschool co-op. When my kids were young and life was busy, I partnered with another mom from our church. She was also homeschooling her children. We met two days a month and cooked 20-25 meals for each family. One day we made her meals and another day we made mine. We benefited from a freezer full of meals allowing us one less thing to plan throughout the month, and we gained encouragement and ideas from the fellowship. – Engage your spouse. Give them updates on school. Let them be a sounding board. Give them things to pray about. Make them a partner in the education process. This may look different in each family, but at some level it must be a team effort. – Plan some field trips with other homeschool families. The kids enjoy the community and the adults are blessed by their own interactions. – Look for parents who are a little ahead of you in the job of parenting. Watch for the ones who are having a measure of success. Invite them into your life. Have them in your home. Go have coffee with them. Learn from them. The way you become joined to others in community will vary as much as your teaching methods, curricula and personalities. But find a way. Remember, Satan loves to isolate. Isolation can be a source of discouragement, exhaustion and even depression. Even if fellowship and community comes in small doses, find a way to make it happen. You were designed to be refreshed by others.